We have 5.5 acres with several hundred white pines, 7 blue spruce, and 2 red pines. Several of the blue spruce are dying. Several years ago, two started dying from the bottom up. We put evergreen spikes around them, and after a year or so they came back to normal. Presently some of the large ones are now dying from the bottom to the top. We put spikes around two large and one small, but they continue to deteriorate. A: Blue spruce is not particularly well-adapted to Indiana. They suffer in heavy, poorly drained soil as well as from extreme heat and drought. They are also susceptible to a number of fungal diseases. If caught early, there are fungicides that can be applied to protect the healthy foliage, but it must be applied early in the season as the new needles are still elongating, and then repeated for 1-2 more applications, depending on the weather. Unfortunately, not much can be done to save them once the injury has progressed to the point seen in your photos. When it’s time to replace them, you might consider other species of spruce that are better adapted to our area, such as white and Norway spruce. You can read more about this blue spruce dilemma at https://www.purduelandscapereport.org/article/blue-spruce-update/. A: A number of insecticides are labeled for control of Colorado potato beetle on potatoes. Unfortunately, this pest is developing resistance to insecticides when the same product is used repeatedly. So rotating among unrelated insecticide products is advised. Other products that are labeled for Colorado potato beetle include Bacillus thuringiensis (sold as BT, Dipel and others), bifenthrin, and spinosad. Be sure to read all label instructions and follow the days-to-harvest restrictions. Additional strategies include rotating your crop plans out of potato for a year or two. 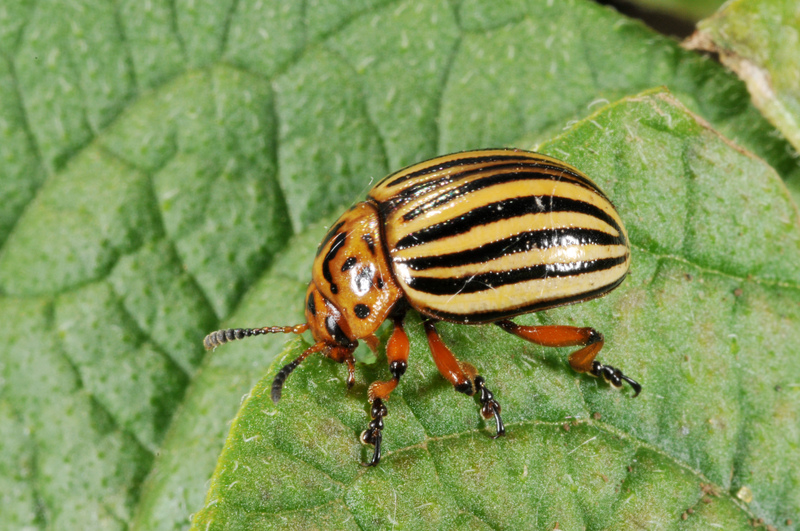 But the Colorado potato beetle will also feed on related plants in the nightshade family, including tomato, pepper and eggplant, so you’ll have to rotate out of those as well. In addition, control/prevent related weed species such as buffalo bur and black nightshade.